Here is a strange beast. What might at first appear to be a piece of literary scholarship is many things: an insight into the embodied work of writing, a map of the ugly overlaying of racial anxieties and aesthetic terror, and a handbook for exploratory walking drawn from the notebook of a genius of dread. David Haden makes a very good case for the night wanderings in New York City of the horror writer H. P. Lovecraft informing that writer’s invention of the Cthulhu mythos – a limitless history of ancient, giant and (crucially) unspeakable beings, obedient only to some cosmic geometry. These beings, oscillating somewhere between geology and organic mush, sleep and wait in a sunken city, R’lyeh, under one of the oceans of the Earth. Haden’s studies of Lovecraft’s biography and letters allows him to draw connections between the horror author’s formative reading, the conditions for pedestrians in New York in the early 1920s and the formation of a fictional geo-monstrosity. 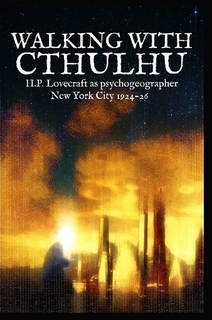 Haden describes the “spectacular and fantastical shows” of 1920s window dressing, cinema as a “new mental operation of projecting desire” that had escaped into the streets, the city as a labyrinth and the subway as an “antechamber of Hell” - describing a stampede of his monsters, the Shoggoth, he uses the analogy of “a vast, onrushing subway train as one sees it from a station platform”. Significantly, Lovecraft here places himself inside the analogy; he is the passenger on the platform, and Haden takes that further – Lovecraft is the pedestrian explorer of the city that is turned into a sunken haven of horror. Haden persuasively identifies Garret P. Serviss’s story ‘The Second Deluge’ (1911) as a likely conduit for the transformation. Haden does not shirk from laying out Lovecraft’s racial anxieties and racist contempt, but he misses a trick (as does Michel Houlebecq in his essay on HPL) by allowing his contextualisation of those prejudices and fears to stall his argument. What remains to be done is to trace those attitudes and emotions forwards to the horror of the fiction. Yet in every other respect Haden completes the task and opens up for us a site-specific mythic city, New York as sunken and abstracted to the ocean, its monstrous architecture taking the form of “god in insect form” (Melville). For those of us who use walking as an exploratory practice, Haden has given us a whole chapter to serve as a handbook of ambulatory techniques for our use – connected ambiances, camera mind, mania, taking fragments – each one taken from a documented aspect of HPL’s night time walks, and set within the context of a history romantic and post-romantic walking (from De Quincy to Stewart Home via Machen).